Roger Federer had an incredible 2017 season and started off 2018 by winning his 20th grand slam title at the Australian Open. In this article Top Tennis Training coach Simon Konov will take a closer look at Roger Federer’s game and see what lessons we can all take from the great one. Federer’s game is built around weapons. He may not have the biggest tennis serve in the world, but his accuracy, consistency and disguise make him one of the hardest players to break. In the past year Federer has held serve 92.4% of the time, third on the leaderboard behind only Isner and Karlovic who both stand 9 inches taller than him. 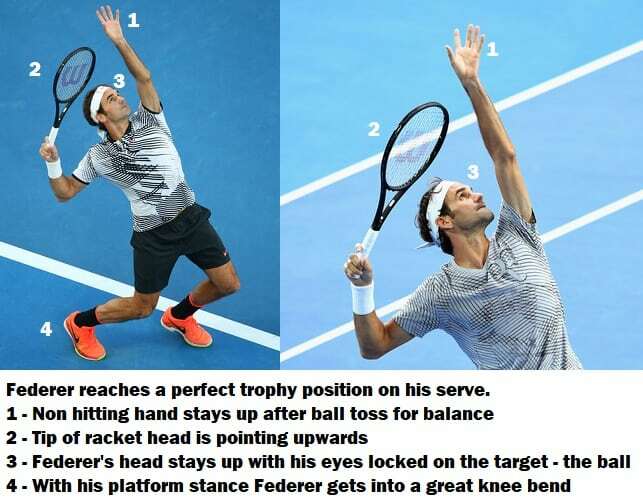 Federer uses a continental grip to serve with and a platform stance which means his feet stay around shoulder width apart throughout the motion until he drives up. His ability to disguise the serve comes from his ball toss remaining roughly the same for all serves which is possible as he tosses the ball in line with the baseline and the ball arcs from right to left. This was also the case with Pate Sampras’ serve. 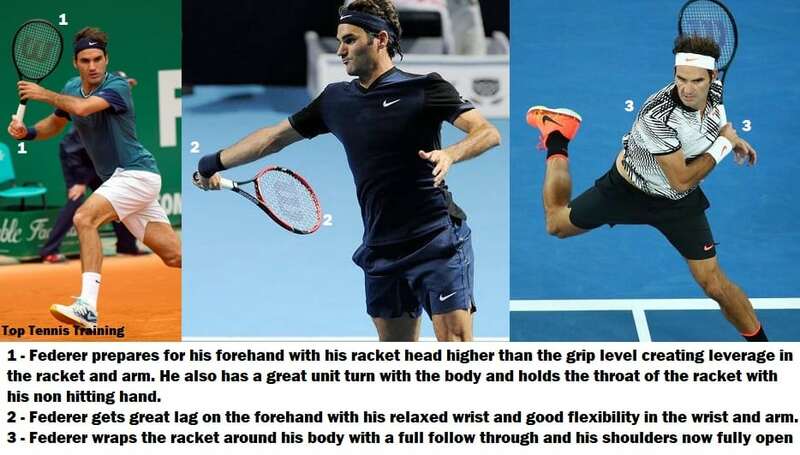 Federer has a very relaxed service motion which allows him to generate effortless power through the use of the major muscle groups which include the legs, trunk and the core, the arm is the last peice of the puzzle. Federer's forehand is one of, if not the best forehand of all time. His ability to mix up the spin levels between heavy topspin and flatten out the forehand gives him a huge edge over other players who use mainly one of those two options. Certain players will be able to hit more power or more topspin but Federer's strength lies in the variation along with his ability to take the ball so early, sometimes as a half volley near to or inside the baseline. Federer uses an Eastern forehand grip that sometimes moves round slightly to somewhere in between the eastern and semi western forehand grip. Federer has a great unit turn at the start of the stroke which helps him coil his upper body and core muscles which will later uncoil giving him effortless power using the major muscles instead of the arm only. Federer starts the swing back with his racket head higher than the grip level which creates leverage in the racket and arm, leverage equals more force over the ball. On the forward phase of the swing Federer achieves great forehand lag by having a loose wrist and using the momentum he's created with his shoulders opening and the leg drive. Federer makes contact in front of his body with an almost fully extended arm and finishes with a good follow through that allows his muscles to slow down and stop in a relaxed and natural way. Federer's racket commonly finishes with wrapped around his left shoulder or touching his back. Federer's one handed backhand was considered the weakest shot in his game for most of his career but in 2016 he hired Ivan Ljubicic and together they have transformed the stroke. Roger has always possessed the best slice in the game but now his topspin drive is also one of the best one handed backhands in tennis. Federer has admitted that he spent a great deal of time at the end of 2016 just working on his backhand for hours on end. The result was obvious at the 2017 Australian open final against his main rival Rafael Nadal. Nadal has always been able to expose Federer's backhand wing but in that match Federer's backhand not only held up but helped him with the trophy. Federer was taking it earlier than ever before and not allowing Rafa's topspin to kick him off the court. He also hit mainly drive backhand returns instead of his old tactic of slicing the ball back into play. Federer prepares early which helps him create time. As early as he can Federer's right shoulder turns side on to the net and he starts the racket preparation. 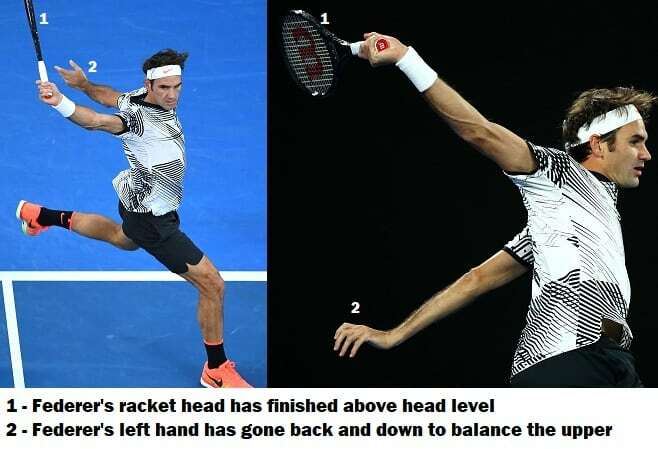 Federer reaches a good back position with the racket head higher than the grip level which helps create the essential leverage (force) for the stroke. 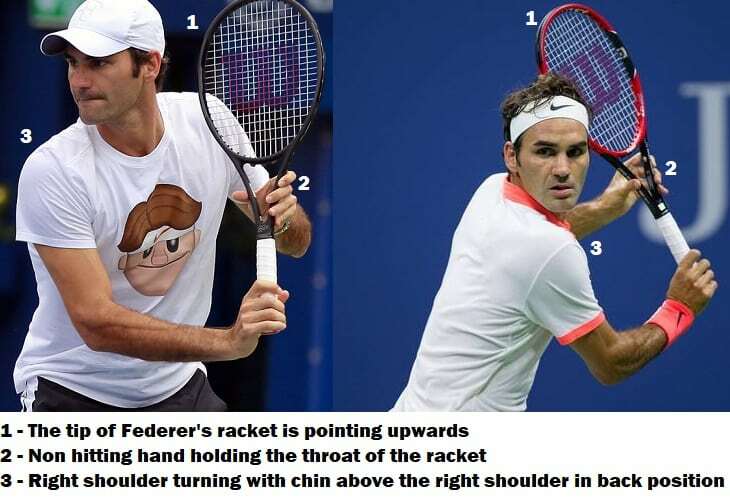 When Federer reaches the back position his back is almost facing the net and his chin is above the right shoulder. He tracks the ball extremely well right up until the contact point. Federer makes contact out in front of his body and uses his non hitting hand to counter balance the racket and hitting arm which helps him maintain balance and stops the shoulders from opening up too early. Federer at 36 years of age still has the best footwork in the world. He glides around the court almost floating to and from the ball. Compare this style to someone like Rafa who also moves very well but has to expend much more energy due to his build. Because of Federer's footwork patterns and the steps he uses to get to the shot and recover he can cover great distances on court with minimal effort and efficiency. He rarely is out of position for shots because of his explosive recovery steps back into the correct court positions. Federer works on his footwork on a daily basis with his fitness trainer Pierre Paganini who has been training him physically since 2000. How has Roger Federer been able to compete at the highest level for almost 20 years? A big part of his success is his gamestyle. Federer is an aggressive all court player who has constantly worked on improving his game over the years. When he first came on tour Roger used the serve and volley tactic much more than he does even now as the courts and balls were generally faster than they are currently which rewarded such play. When tournaments started to slow down play by making the courts slower and the balls bigger Federer had to adapt to his style. He stopped attacking the net as much and relied more on his forehand as his go to weapon. When Nadal became his most dominant opponent, Federer hired Paul Annacone to help him once again shorten points and get into net more. Later Federer hired his idol Stefan Edberg to perfect the serve and volley and net rushing tactic and then finally when he needed to improve his backhand he hired Ivan Ljubicic. His game has been built on precision serving and dictating play with his forehand but Federer also has the ability to defend well and stay in points when he needs to. However is main style is an aggressive one which sees him finishing off points. This has allowed him to stay healthy and prolong his career. Over the years I have been extremely lucky to film Roger Federer up close at various events including Indian Wells, Monte Carlo, Wimbledon and the ATP world tour finals. I must have attended and filmed at least twenty Federer training sessions and watched him compete over ten times yet nothing comes close to when Alex was called up to help Federer prepare for the ATP world tour finals. Meeting Roger was an incredible experience but also very eye opening. I was on court with the GOAT for over two hours and managed to film a good portion of the training session. Afterwards we also spent a good thirty minutes just chatting with Roger and his team including Stefan Edberg. Federer grips the racket as if he is holding onto a small bird, tight enough to keep it from flying away but loose enough that it doesn't choke. Because of this trait Federer gets the most out of his muscles without wasting energy. Federer's racket disappears for split seconds when he wants it to. One second you see him preparing for a forehand and the next second the racket is wrapped around his shoulder at the end of the stroke. This is the result of years of training and is no accident. Federer's hand skills and feel for the ball is the reason he can hit those special shots that only he can pull off. This is talent combined with years of training and improving his natural ability. Many people think that Federer is just naturally gifted and doesn't need to work as hard as a Nadal for instance. Federer not only works hard but works harder than most. 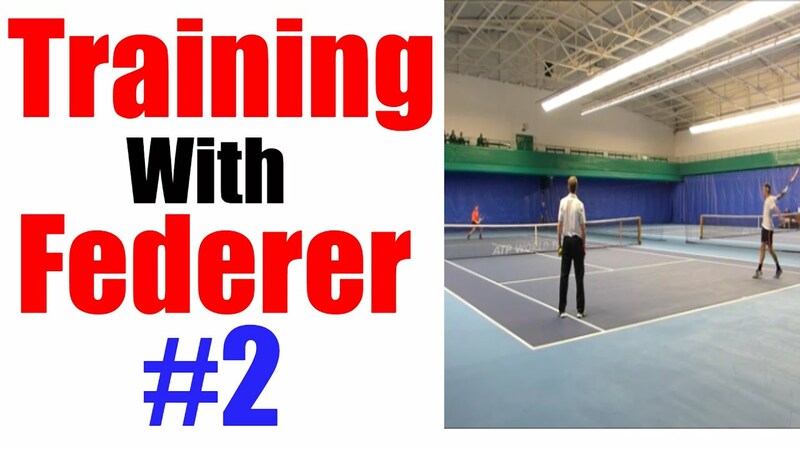 During the training session Federer asked Stefan Edberg to stand on one side and Alex on the other side and move him around trying to hit winners against him. Federer didn't let one ball go by him, he chased everything down, even balls that were out. In between rallies Federer was leaning on his knees trying to catch his breath, something I had never witness before. Behind closed doors Federer works like an animal, it is this work ethic which has allowed him to dominate and perform at the highest level for so long while making it look so easy. Get more than 500 with a vip membership! David Ferrer, former world number 4 has wins over Rafael Nadal, Novak Djokovic, Stan Wawrinka, Andy Murray and many other legends of the game. For the first time ever, he will share his tennis knowledge with you to help you transform your game! Receive exclusive videos, content & expert Feedback on your game!